Dentists: the terror of children and a need for the elderly. You can go most your life without falling ill, but if you don’t take care of your teeth, no amount of apples will keep this doctor away. Students can either opt for general dentistry, where they study all the above disciplines, or specialise independently in any of the above sub-disciplines. Depending on why you want to take up dentistry, you can make the choice of specialisation. USA does not offer under graduate dentistry courses. So, if you want to do dentistry in USA, you have to complete a bachelor's degree or at least attend university for two years. We might not like them, but we can’t deny the fact that we need them. In the field of dentistry the only factor that might affect your ability to practice in any country, other than where you took the course, is the regulations governing practice in that country. Like most medical courses, dentistry does not really require you to work with a hospital. The training given during your course will be enough for you to start with your own practice. However, the suggestion is to first work under a renowned hospital or dental clinic. The experience you gain there will give you considerable experience that you can use when you want to start your own practice. While practicing in any of the above areas, you can choose between setting up your own clinic and attaching yourself with another dentist or hospital. Depending on your skill level, experience as well as other factors, either or all options are definitely viable and profitable. 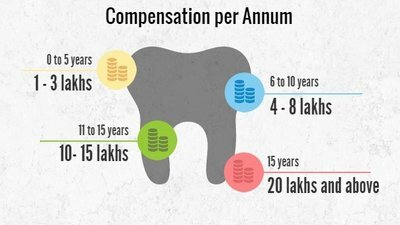 If there is one big advantage of studying dentistry, it is the money. Whichever country you are planning to practice in, it is one profession that will help you reap huge benefits. While dentists across the world are well paid, it is the best profession to be in the UK, where dentists charge truly exorbitant rates. It’s funny, but true. People often say that a dentist is one who puts a hole in your pocket to fill another in your mouth. If you want to prove this wrong, dentistry is the perfect option for you. However, like any other profession, dentistry also has its own set of advantages and disadvantages, which you should consider before opting for it.